Latest News: The Hyundai i20 Active facelift has been spied testing in South Korea. The camouflaged car featured LED tail lamps and repositioned number plate on the tailgate. Read more about it here. Hyundai i20 Active Price: The updated Hyundai i20 Active 2018 is priced in the range of Rs 6.99 lakh to Rs 10.01 lakh (ex-showroom New Delhi). Head over to the launch news for more info here. Hyundai i20 Active variants, engine and mileage: The Hyundai i20 Active 2018 is available with two engine options: a 1.2-litre petrol engine that produces 83PS/115Nm, mated to a 5-speed manual, and a 1.4-litre U2 CRDi Diesel engine that is mated to a 6-speed manual and puts out 90PS/220Nm. The Hyundai i20 Active returns a certified mileage of 17.19kmpl (petrol) and 21.19kmpl (diesel). 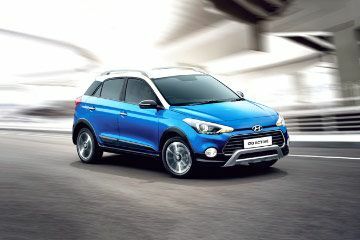 The Hyundai i20 Active is available in three variants: S, SX and SX (dual-tone) with both petrol and diesel engines. The petrol, however, is also available with a base variant. Hyundai i20 Active safety features and equipment list: The Hyundai i20 Active gets dual front airbags and ABS with EBD as standard across the range. The top-spec SX variants additionally offer side and curtain airbags and ISOFIX child seat anchors. In terms of features, like the Elite i20, the Active also packs a 7-inch touchscreen infotainment system with Apple CarPlay and Android Auto compatibility, rear parking camera with sensors, auto climate control with rear AC vents, and automatic projector headlamps with LED DRLs, among others. Hyundai i20 Active rivals: The Hyundai i20 Active 2018 goes up against vehicles such as the Honda WR-V, Fiat Avventura and the Tata Nexon. What is insulation price of Hyundai i20 Active VTVT O hood in hissar haryana? The Hyundai i20 Active is essentially a cosmetically enhanced Elite i20. The car features add-ons like black body cladding, roof rails and different bumpers, while the 190mm ground clearance is more than the Elite i20’s as well. It also comes with some unique changes to the interior and Hyundai introduced the model to appeal to crossover/SUV crazed buyers, who still want the practicality of an urban hatchback. Here’s a look at what the i20 Active’s package includes. The Elite i20 was already a stylish, well-built and feature loaded car. The i20 Active simply offers the same traits in a more butch avatar. Make no mistake, it’s not an off-roader, but thanks to the raised ground clearance, it can deal with rough roads better. It’s still a great city car and offers the easy of use you’d expect of a hatchback, but thanks to the cosmetic changes, it has more road presence too. Choosing it over the Elite i20 is primarily a matter of personal preference when it comes to styling. Make no mistake, it’s not an off-roader, but thanks to the raised ground clearance, it can deal with rough roads better. Dual airbags offered as standard. Side and curtain airbags offered on top-end SX grade. Butch crossover styling and 190mm ground clearance. 1.4-litre diesel engine offers great performance and driveability. Aqua blue interior colour (offered with Sleek Silver and Polar White exterior paint shade) may not be to everyone’s taste. The claimed ARAI mileage: Hyundai i20 Active Diesel is 21.19 kmpl | Hyundai i20 Active Petrol is 17.19 kmpl. Based on the Elite i20, which is anyway an excellent car, does the Active tag chisel out the i20’s shortcomings or the added bulk and ground clearance comes with its own baggage? It's time to find out. Hey buddy, which car are you talking about? You need to check this with the dealership. As dealer will be the right person to provide you a final confirmation on it. Also, you can check the car personally over there.